Rolling Mills - General View [Jamalpur Railway Workshops]. bl.uk > Online Gallery Home	> Online exhibitions	> Asia, Pacific and Africa Collections	> Rolling Mills - General View [Jamalpur Railway Workshops]. Interior view, showing rolling machinery at the Jamalpur Railway Workshops taken by an unknown photographer, c. 1897 from the Elgin Collection: 'Presented to His Excellency the Earl of Elgin & Kincardine...as a Memento of His Excellency's Visit to the East Indian Railway Workshops at Jamalpur November 30th 1897'. The main workshops for the East India Railway Company were built in 1862 at Jamalpur, some 300 miles north-west of Calcutta. 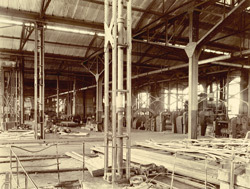 These expansive workshops were designed to undertake every aspect of the overhaul and repair of the Company’s railway locomotives and from the 1880s they started building new locomotives, making all the parts except the wheels which were imported. By the 1880s the workshops employed 5,000 people and by 1906 the number was close to 10,000.